As you can see from the chart, the fall has been fairly dramatic, even if it has not yet taken share prices on the Shanghai Composite Index below where they were previous to a perilous bull run that began in February. The fall has apparently alarmed the Chinese government, which has authorized extraordinary interventions. Among them: twenty one Chinese brokerage firms have agreed to invest the equivalent of $19 billion in stocks, in an effort to create more demand. The stock exchanges suspended initial public offerings so as not to put any more shares on the market. The Chinese central bank has cut its benchmark lending and interest rates rates. And the government itself, through its pension system, has now been authorized to “play” the market. Perhaps the most ominous intervention, however, came when China’s market regulator decided that brokers should not force people who have bought stocks on margin (borrowed funds) to engage in forced selling in order to cover their debts. Instead, the brokers were told to extend additional margin loans that would be collateralized by investors’ homes. If the market continues to plunge, observers wonder, how will investors (or banks) liquidate those houses? Is it wise to spread the risk from the stock sector to real estate valuations? The brokerage pledge to buy shares is reminiscent of 1929 Wall Street, when the great banking houses of J.P. Morgan and Guarantee Trust Company committed their resources to propping up the U.S. stock market. That experiment was not a notable success; the Dow Jones Industrial Average fell 13% the following Monday and dropped another 34% over the next three weeks. The Chinese intervention fund, led by Citic Securities Co. and Guotai Junan Securities Co., faces a similar uphill battle; the war chest represents only one-fifth of the Chinese market’s daily trading volume. Moreover, the margin loans carry annual interest rates as high as 20%. Total margin debt, when you add up the brokerage firms, banks and informal loans, could amount to as much as $1 trillion. As share prices fall, investors would be left with far less in stock value than the high-interest loans they owe—making repayment problematic, potentially putting $1 trillion worth of stress on the Chinese banking system. It gets worse. Many smaller Chinese companies have financed their expansion by taking out loans against the value of their shares. The companies have had to post additional collateral as the share value dropped down to the outstanding balance on the loan. Additional market losses could put these companies in real danger of default, adding to the stress. Nobody knows if the free-fall will continue to feed on itself, or if the government will somehow manage to slow the descent. But highly-leveraged investing on a mass scale seldom ends well, as most of us remember from the subprime crisis when we had to reach into our pockets to make Wall Street whole again on its disastrous speculations. Fortunately, none of this is likely to directly affect the portfolios of American investors, since foreigners account for only about 4% of the Chinese stock market. But as the crisis deepens, and especially if the defaults start to mount, companies go under and the banks stop lending into the economy, you could see commodity prices fall on weaker demand, and there could be a hit to large American companies that do a lot of business in the Asian markets. As an emerging market, China’s setback could pressure emerging market funds, which many of us are exposed to in our portfolios. 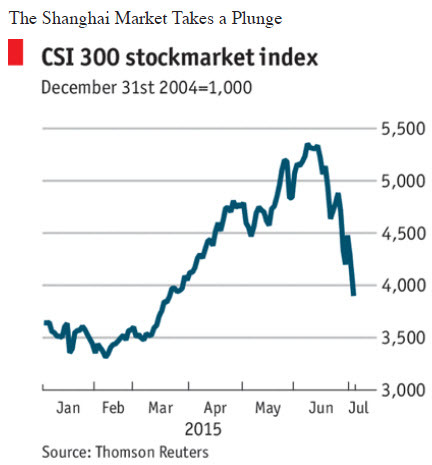 Finally it could be a long time before individual Chinese investors trust the stock market again. That would be exactly the opposite of the Chinese government’s plan.